Cut away brush and clear small trees with the brush saw attachment (also known as a brush cutter). The high-torque, low-speed hydraulic motor powers the steel blade, which features replaceable carbide-tipped teeth. Position the boom manually in up to three positions – center, or 12 degrees left or right – to operate with excellent visibility of the cutting and clearing action. Quickly and conveniently remove small trees up to 15 feet tall without leaving stumps. Unlike a tree shear, this heavy-duty attachment saws off trees flush with the ground or even a little below the surface. Clear the way with the Bobcat® brush saw attachment. With the Bobcat brush saw attachment, you can cut and brush small trees swiftly and with accurate precision. The brush saw comes with high-torque and is powered by a low-speed hydraulic motor that controls the performance of steel blade. It also has a replaceable carbide-tipped feature, which helps in the precision of cutting small trees or trimming bushes. In order to operate this outstanding brush saw, you need to position the boom manually. There are three ways you can position the Bobcat brush saw: one, in the center; two, 12 degrees left; and three, 12 degrees right. It provides transparency and complete visibility of cutting grass. It also removes trees up to 15 feet tall with ease and precision without leaving any traces or stumps. The blades are sharp enough to cut as smooth as butter. 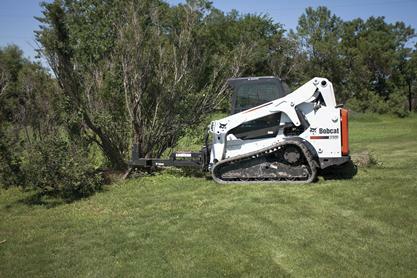 Bobcat’s genuine heavy-duty attachment can cut the tree off from the ground without any trace. The product can fit snugly onto various shapes and sizes of machines, greatly enhancing your cutting experience. If you want your garden to look excellent, Bobcat is the brand to trust, and this great attachment from Bobcat is matchless and incomparable. Bobcat’s expert team will assist you in servicing the parts or you can do it yourself by following simple instructions provided by the professionals at the time of your purchase. You can always clear any path with ease using the Bobcat brush saw. Once you go Bobcat, you’ll never go back! You’ll get hooked on the ease, precision, and durability of this attachment and more. Clean road and utility line right-of-ways. The counter clockwise blade of the brush saw moves at a speed up to 2985 ft./min. The cutting action of the brush saw cuts trees, brush and saplings just below ground level to minimize stumps. The operator uses the loader steer and travel functions to swing the brush saw left and right, and to move forward into the material being cut. Materials cut away are discharged to the left and away from the loader and attachment. High-Tensile Steel Blade: Built for maximum durability, the high-tensile steel blade has replaceable weld-on carbide-tipped teeth. High Torque, Low Speed Motor: Increases the efficiency of the saw while decreasing the possibility of stalling during cutting action, decreasing downtime and creating fewer hassles on the job. Manual 3-Position Boom Angle: View the attachment from up to three positions: center, or 12 degrees left or right. Choose the angle that provides the best cutting visibility. Steel Deflector Shield: Protects and prevents the operator and loader from flying debris, minimizing harm and costly machine maintenance. Special Applications Kit: Must be installed on the loader when operating the brush saw attachment. This kit includes a polycarbonate door and windows to protect the machine and operator from debris.